The era was 1976 to 1985. 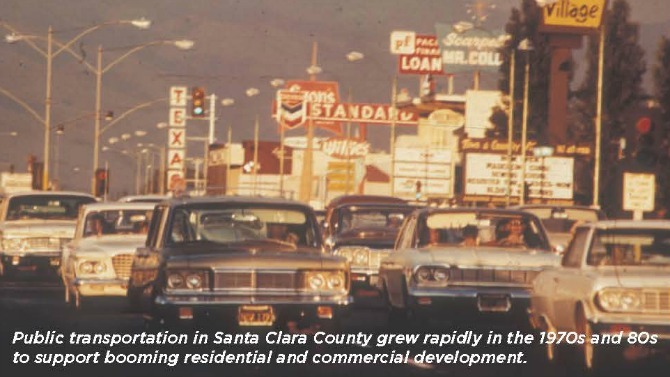 Santa Clara County was known for its rich agricultural base and growing technology industry. The economy was booming as major industries were drawn to the Bay Area for its skilled work force and natural resources. Leading corporations for defense, microprocessors, and computer chip manufacturing brought tens of thousands of new jobs, requiring a robust transportation system to support movement of their employees and goods. As industrial parks and housing developments popped up like mushrooms across the county, public infrastructure was strained and local leaders, and budgets, were challenged to expand and keep up with the rapid growth. 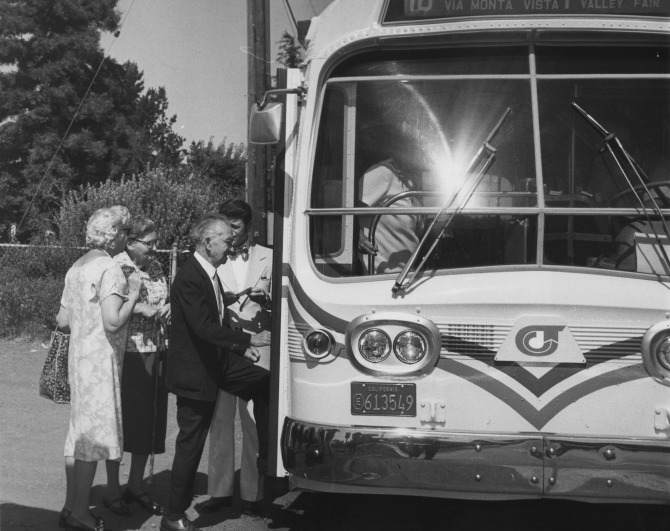 On June 6, 1972, residents approved the creation of the Santa Clara County Transit District (“County Transit”). The transit function was incorporated into the county government structure, which at that time encompassed planning and development, aviation, and road operations. The road operations division was responsible for 68 miles of expressways and 79 miles of county roads, and the aviation division was responsible for the county’s three general aviation airports. County Transit bought out the three financially strapped local bus lines and on January 1, 1973, residents boarded their first publicly operated bus service. Operating with a fleet of 50 buses in serious need of upgrades and repair, VTA obtained federal funds in 1973 to refurbish the older coaches and purchase 134 30-foot propane powered buses. On March 6, 1976, Santa Clara County voters approved a permanent half-cent sales tax to help support the growing need for services. As additional funding was secured and workloads increased, County Transit expanded to meet the demand. 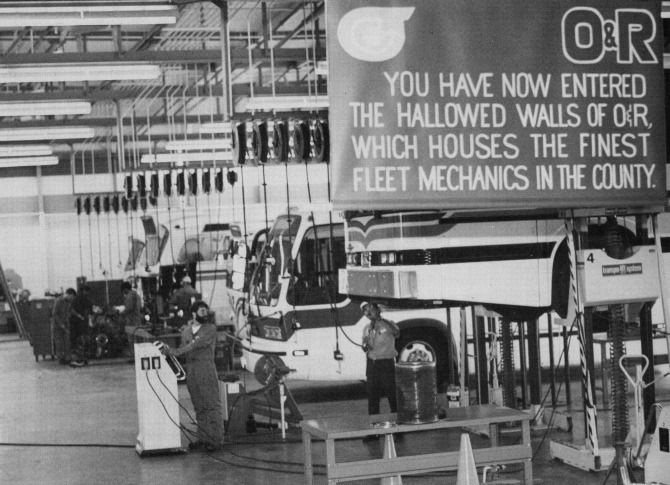 In 1977, County Transit’s primary Overhaul and Repair Facility was built at the Cerone Yard. County Supervisors decided to change the bus fleet from propane to diesel and ordered 102 buses. By 1979, three additional bus yards were built and commissioned into service. Moving towards the goal of building a mass transit system for a growing urbanized area, the County received $2 million from the federal government in 1982 to fund the preliminary engineering phase for the County’s first light rail line. Construction started with the maintenance facility, which was completed in 1986. Located in downtown San Jose, this facility is still used today to store, clean and repair VTA’s 99 light rail vehicles. In addition to the progress being made on building the public transit system, highway projects also received a boost. In No­vember 1984, voters approved a 10 year half-cent sales tax for highway projects. During this period of rapid growth, Santa Clara County experienced a widening disconnect between the location of major employment centers and housing development. Large corporations, including Microsoft, NASA, HP, Lockheed Martin, Intel, Cisco and others established sprawling campuses in the north part of the county, while suburban housing developed to the south. This land use pattern necessitated expansion of the highway infrastructure and increased investment in mass transit options to move large numbers of commuters quickly and conveniently between their homes in the south and jobs in the north. Those commuting regionally from Santa Clara County to San Mateo and San Francisco counties had the option to travel by the Southern Pacific train. In 1977, Southern Pacific abandoned passenger service and the three Peninsula counties stepped in, partially subsidizing commuter tickets and effectively reversing a long pattern of declining ridership. This set the stage for state sponsorship of the service and, in 1987, the state assumed sole responsibility until the formation of the Peninsula Corridor Joint Powers Board in 1987. Please click here to learn more about this decade and see other great historical photos. The next decade, and the next part of our informational series, was defined by VTA’s progress in strengthening the transit network by growing additional light rail lines and partnering passenger rail services. Up next, 1986 to 1995. All aboard!